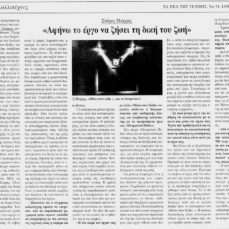 Translation of Spiros Pierris’ interview in the Greek Edition of The Art Newspaper, No 54, January 1997. At the beginning of last spring the architect and visual artist Spiros Pierris presented his new art installation under the title “Inside the Cube…and the dream lives on” at the art gallery Antonia Havani Contemporary Art in Corfu. In this site specific video installation the artist has assigned a dual dynamic to his work which revolves around two axes: in one room of the gallery there is one single work; the cube-box rendered in lead and in the other adjacent room the artist has created a cube-room also rendered in lead. In the second space the spectator is given the opportunity to watch a video clip on the TV screen connected to a network of a video camera, a video recorder/player and a screen, and is put in the position to decide for his/her role and his/her relationship with the space. In the first page of the exhibition catalog the artist quotes Nietzsche “ what is born in light continues to live in darkness”. Is Spiros Pierris implying some form of fatality at least with regard to the second part of his installation? 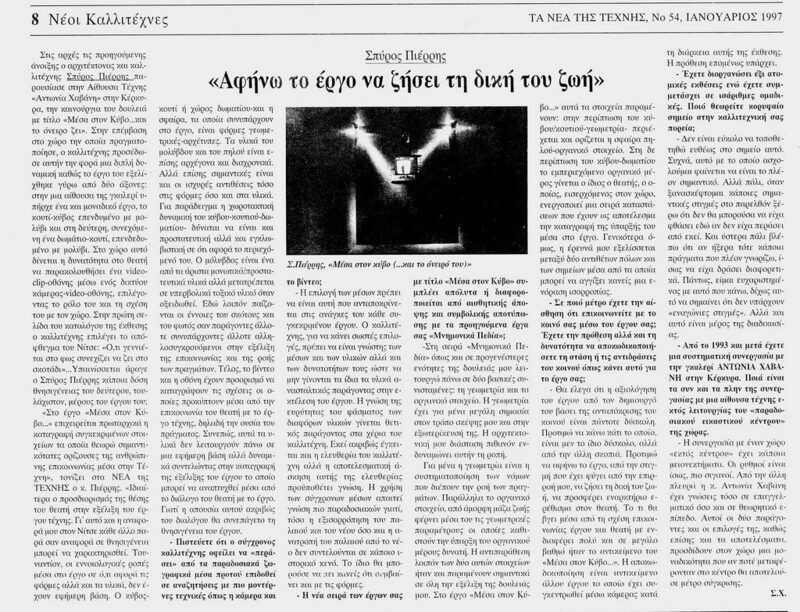 “In the video installation Inside The Cube what is effected in the first place is to register specific elements which I consider them to be extremely important in determining human communication in Art” Spiros Pierris emphacises in The Art Newspaper. “In particular the definition of the spectator’s position in the ongoing nature of my work (work in progress). Therefore my reference to Nietzsche can not be interpreted as death of the artwork. On the contrary the conceptual elements in the work referring to forms but also to materials do not stand on an ephemeral base. The cub-box or the cube-room and the clay sphere or the human (spectator) are geometric and archetypal forms. The materials of clay and lead are also archegonal and diachronic. But also the strong contradictions in forms and materials bear great importance. For instance the spacial planning dynamic of the cube-box-room imply protection or entrapment with regard to their content. Lead is one of the a major insulators against radiation – thus protective – but it also becomes highly toxic once oxidized. Here then the meanings of light and darkness are engaging in a play where they become akin to each other or at other times they oppose and contradict each other in the flow of things. Finally the video camera and TV screen are intended to record the relationships that arise from the interaction of the spectator with the art work which is the purpose of the whole exercise. In this way these elements do not function in an ephemeral way but dynamically contribute to the registration of the ongoing process through the dialogue between the spectator and the artwork. Because the lack of such a communication would indeed signal the death of the artwork. Do you believe that the contemporary artist ought to “go through” traditional art materials before becoming capable of using more contemporary techniques as the video camera? The choice of media in art should be made on the basis of what would best apply to the needs of each particular artwork. Artist in order to be effective in their choices ought to have a deep knowledge of all kinds of media and their possibilities otherwise the use of the materials by itself may become inhibitory and restrict or destroy the work. The knowledge of the breadth and diversity of materials becomes a positive factor in the hands of the artist. It is here that that the artist’s freedom lies but the effective execution of this freedom has knowledge as its one of its prerequisites. The balancing act between the old and the new or the subversion of the old by the new can not take place in some historical vacuum. One would argue that the same holds true not only for techniques but also of forms and the whole spectrum involved in artistic production. Your new work “ Inside the Cube…” does it keep in line with previous units of your work or does it differentiate aesthetically and symbolically from previous units of your work as for instance the unit “Mnemonic Fields”? In the series “Mnemonic Fields” as with earlier periods of my work I function on two basic elements: the geometric and the organic. Geometry bears for me great importance in my way of thinking and how this is manifested. My architectural dimension probably reinforces this tendency. For me geometry is a systematisation of the laws that guide the flow of things. In parallel the organic element as amorphous mass bears in it geometric parameters that render its existence possible. The juxtaposition of these two elements were and remain of high importance in the development of all my work. In “Inside the Cube…” these elements persist: in the case of the cube/box – geometric – the clay ball is contained and defined as the organic element. In the case of the cube/room the contained organic part becomes the spectator who at the moment of entry in the room activates a series of situations which result in making a record of his/her existence inside the artwork. More generally my research evolves between two antithetical poles and the positions from which one can strike a vision of equilibrium. In what measure do you feel that you communicate with your audiences through your work? Do you intend or have the ability to decode the position or the reactions of your public as this does for your oeuvre? I would say that the evaluation of the art product by the artist who produced it based on the reaction of the public is a difficult issue. I prefer to do something that is also difficult but from another angle. I prefer, from the moment the work has left my influence, to let it live its own life, to stimulate its audiences. That which will result from the relation of the communication of the spectator and the work of art is of great interest and to a great degree it has been at the centre of “Inside the Cube…”. The decoding of this communication is the object of another work on the basis of the material video-recorded during the length of the exhibition. Therefore yes the intention is there. You have had six personal exhibitions and have exhibited your work in numerous group exhibitions. Which do you consider to be the supreme point in your career? It is not easy to give a straight answer on this question. Often, what I am pursuing at each given moment seems to be the most important. But again when I come to think some decisive moments of the past I know that I would not be here if I had not gone through them. And then I see that if I knew then certain things that I know now maybe I would have acted differently. However I am contend with what I do without that meaning that there are no agonising moments in the creative process. But this is part of the process. Since 1993 and on you are being represented by the gallery Antonia Havani Contemporary Art in Corfu. What are the pluses and minuses of a collaboration with an art space outside the “traditional cultural centre”of the country? The collaboration with a gallery out of the centre may present some disadvantages. The rhythms are slower. On the other hand Antonia Havani carries deep knoweledge both on professional and theoretical levels. These two criteria and her targeting policy coupled with the results lend the space a unique position to such an extend that if she ever moved to the centre it would set new standards.